This Santa is just THE CUTEST and I couldn’t resist using him for the Create with Connie and Mary Thursday Challenge this week (a fun SKETCH challenge!). I used him for a project I made for the Create with Connie and Mary Holiday Collection 2014 and had an extra ‘sitting on top of my desk’ so I just HAD to put him to good use! This is really a very simple card and you really can’t see the ‘sparkle’ I added to the beard/mustache/hat on Santa, the Candy Dots and the embossed snowflakes on the Lost Lagoon panel. Stamp Santa on Whisper White using Memento Black ink, color hat with Cherry Cobbler Blendabilities and face with Skin Tone Blendabilities, cut out and add to card front using dimesionals. Add Dazzling Details to the candy dots, Santa, and embossed stars to finish off. 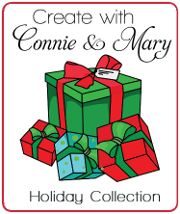 We are in week 3 of the Create with Connie and Mary Holiday Collection 2014 where we are featuring the Christmas/Holiday (no Halloween/Fall) products from the Holiday Mini! 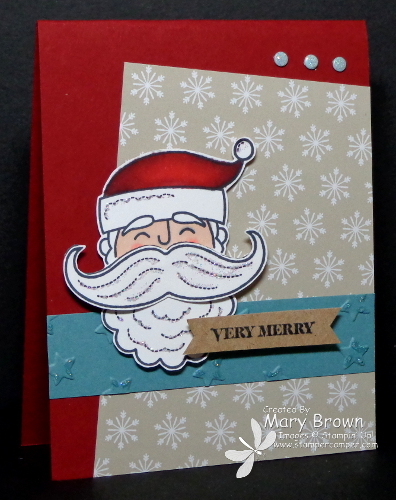 This entry was posted in Create with Connie and Mary, Holiday Mini and tagged Santa Stache. Bookmark the permalink. This Santa is super cute and he works perfectly with this sketch! Love it! I zoomed in so I could see all of the sparkly glitter and it really makes your card even more festive! Cute, cute! What is not to love about this card? Beautifully colored and sparkled up – even on the textured stars – such a cheery holiday card! Awesome Santa Stache card!! I love Lost Lagoon paired with Cherry Cobbler. This is one I know I will have to CASE, it’s perfect!